The adult Glasshouse Whitefly holds its wings in a tent-like fashion over the body, hiding the body and giving it a triangular outline. This is in contrast to Bemisia tabaci, adults of which hold the wings alongside the body, revealing the yellow body colour and giving them an elliptical profile. Adults of T. vaporariorum generally settle on young foliage close to the growing point of the plant, and lay eggs there. Eggs are creamy white in colour when first laid, but turn black within 24 hours. The larvae that hatch are initially mobile, and are known as ‘crawlers’. These soon settle, and the rest of the larval stages are immobile. 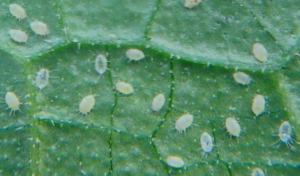 In rapidly growing plants such as commercially grown tomatoes, this often leads to a stratification of whitefly ages on the plant, with adults and eggs at the top, young larvae a little lower, larger larvae towards the middle of the plant, and pupae towards the base. Feeding larvae draw sap from the plant, extract proteins and other nutrients, and excrete the surplus sugars, which are present in the sap as ‘honeydew’. At high populations, the copious honeydew produced leads to the leaves or fruit becoming sticky, and to the growth of sooty moulds which restrict photosynthesis, and are unsightly. Trialeurodes vaporariorum can also transmit some virus diseases to plants, but is less important in this respect than Bemisia tabaci. 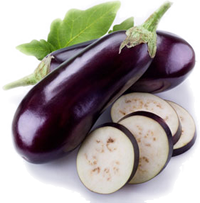 Development is temperature dependent, and may also vary with the crop and cultivar. Some example figures are shown below. 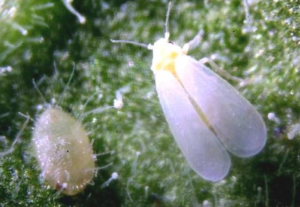 The Tobacco or Silverleaf Whitefly is now the dominant whitefly pest in Mediterranean regions and appears to be spreading northwards. 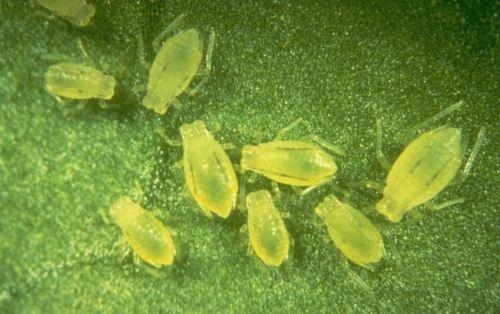 As with the Glasshouse whitefly, the larvae produce copious amounts of honeydew, but adults invading the crop also introduce virus diseases which can devastate the crop. Bemisia tabaci is recorded as the vector of 111 virus diseases of plants around the world. In tomatoes the principal virus is Tomato Yellow Leaf-Curl Virus (TYLCV), whilst in cucurbits there are several species with different symptoms, such as Cucumber Vein Yellowing Virus (CVYV) and Cucurbit Yellow Stunting Disorder Virus (CYSDV). The adult Tobacco Whitefly holds its wings alongside the body, revealing the yellow body colour and giving them an elliptical profile. This is in contrast to the Glasshouse Whitefly, which holds its wings in a tent-like fashion over the body, hiding the body and giving it a triangular outline. Adult Bemisia tabaci will settle and feed on much older leaves than Trialeurodes vaporariorum, so all stages can occur on any part of the plant. Larvae of Bemisia tabaci are generally smaller than those of Trialeurodes vaporariorum, slightly pointed towards the rear end, and remain flattened throughout their development. Trialeurodes vaporariorum larvae are smoothly elliptical, and during the later instars become distinctly thickened, with vertical sides.